Definition: square or thin rectangular pasta made from flour, white wine dough and sometimes egg. 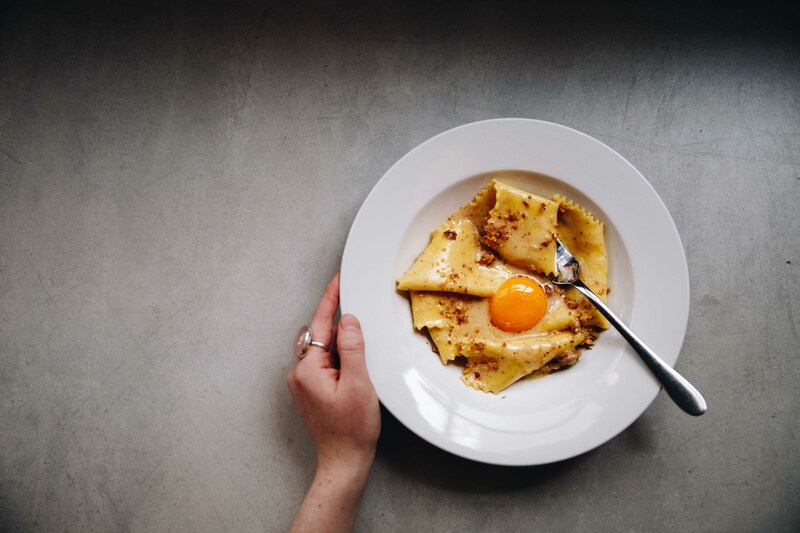 In this month’s pasta series, we share the secrets on fazzoletti, otherwise known as silk handkerchiefs and a great recipe to go with it. As its name suggests, this pasta takes the shape of a handkerchief and the texture is indeed silken – supple, light, smooth and delicious! It’s a rare skill to roll dough so fine but fazzoletti should and must be paper thin (scroll down to see our chefs at work creating this masterpiece). A favoured pasta shape amongst many because of the freeform structure which allows it to be paired with a variety of sauces. 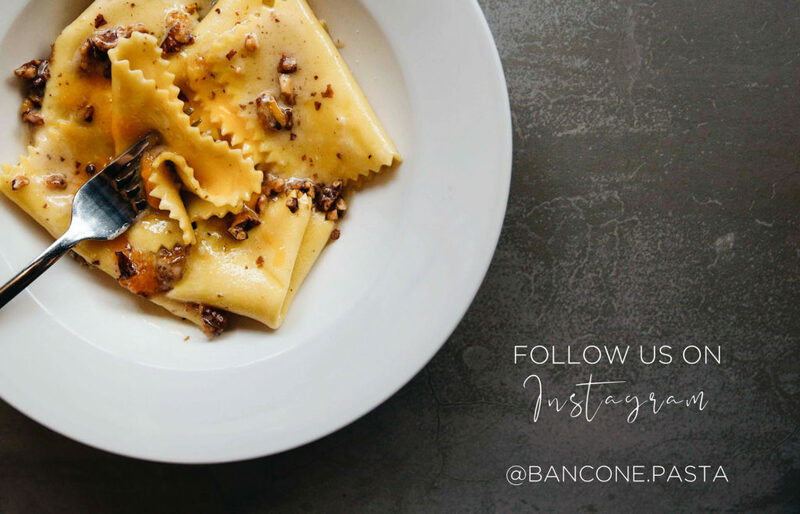 Let the pasta do the talking and why not try fazzoletti with this simple recipe – a favourite from the Bancone kitchen… Use #BanconePastaSeries to show us how you get on! To make the confit egg – in a pan heat the oil to 65degrees C using a thermometer, and be very careful not to exceed this temperature. Carefully drop in the egg yolks and leave to cook for 45 minutes to an hour to reach the right consistency, which is that of a very soft-boiled egg. Cut the lasagne sheets into 12.5cm squares (handkerchiefs). Bring a large pot of well salted water to a rolling boil, drop in the pasta and cook for two to three minutes, until al dente. In a frying pan, create an emulsion by mixing a few tablespoons of the pasta cooking water and the sweet white vinegar. Lift the pasta from its cooking water and add to the pan along with the chopped walnuts. Reserve a few walnuts for garnish. Toss all these ingredients together until the pasta is generously coated in the emulsion. Sprinkle a little grated cheese into the bottom of four bowls. Then, gently fold six sheets of the cooked pasta into each bowl so that they gently nudge each other and look comfortable, like little sheets nuzzling together. 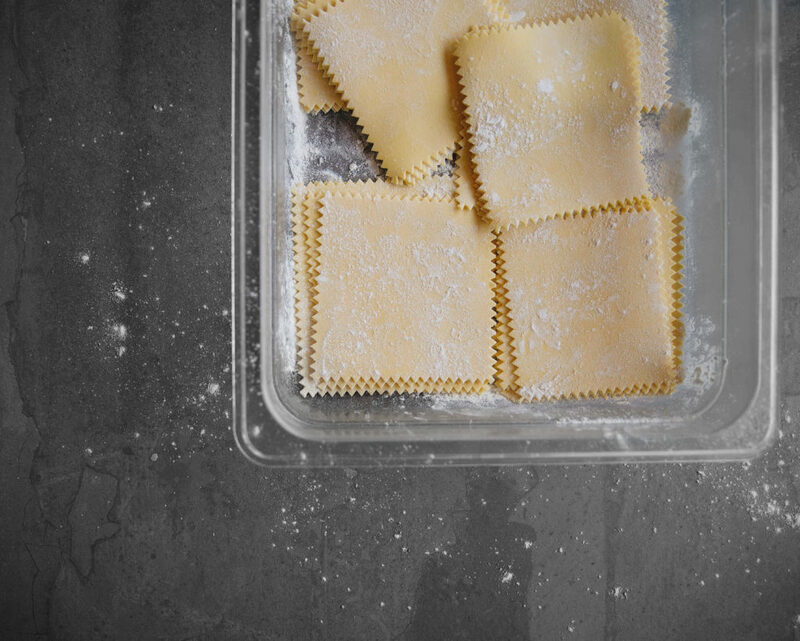 Drizzle the emulsion evenly on top of the pasta in the bowl, then place a confit egg yolk on top of each bowl of pasta. Sprinkle with more parmesan and serve immediately.